Laura Asermily has lived in Middlebury since 2003 and has substantially reduced her home’s energy use during that time. She had an energy audit done on her home to discover where efficiency upgrades would be most effective. Laura’s house, like most, lost the most heat through the roof and the foundation. This surprises many people, who may focus on new windows first, but the most important first steps to weatherization are sealing the attic and basement. To do this, Laura sealed cracks in her basement and added solid insulation panels around her basement walls. She also added cellulose spray insulation in her attic. She uses caulk and spare pieces of insulation to fill any gaps she finds in those areas. Once the most vulnerable areas of her home were taken care of, she moved on to the other floors. Laura uses low-cost options like plastic window insulation kits and curtains to keep the cold out in the winter and her home cooler in the summer. Laura also installed a solar hot water heater. This system uses solar panels on her roof to heat her house’s water, which allows her to not use the furnace much of the year. She added a large enough system to support a larger family in case she sells her home in the future. Laura’s efforts in home heating efficiency have really paid off. Her fuel oil use has decreased from 800 gallons annually to just 400 gallons. These energy upgrades have also benefitted Laura’s tenant, Jason Kaye. Jason moved to Middlebury in 2012 and works in construction, building traditional timber framing homes. He has always considered himself environmentally conscious and appreciates the attention Laura has put into making the space he’s rented efficient. Jason also tries to integrate sustainable habits into his everyday life to save energy. He keeps the thermostat low at night and while he’s away from the house and he turns off lights as he leaves the room. Jason recommends that other renters try the same - instituting behavioral changes on their own and talking to their landlords about possible efficiency upgrades for their living spaces. Spreading the Example - With a Banana! In addition to home efficiency, both Laura and Jason try to conserve energy as they move about Middlebury. Laura drives a hybrid vehicle, but tries to use it as little as possible. Both Laura and Jason live close to downtown Middlebury and run errands by bike whenever possible. 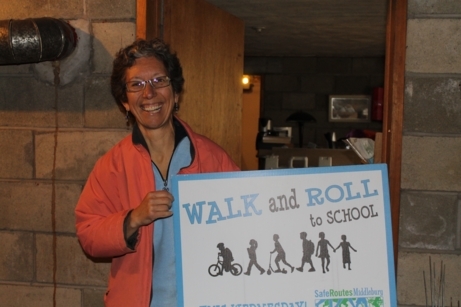 Laura also encourages other folks in town to do the same through her participation in Middlebury’s “Walk & Roll” program, educating kids about walking or riding to school. She even bikes wearing a banana costume to get kids more excited about the program! Laura and Jason are both involved in energy programs trying to shift the town of Middlebury towards a more sustainable future. They are both members of the Middlebury Energy Committee to build more community-wide energy saving initiatives. Laura also participates in the “Low Carbon Diet” 30-day energy challenge. She organizes groups of neighbors and community members who come together to set independent environmental goals and hold each other accountable to meeting them. She says this challenge is helpful in reminding herself that there’s always a little bit more you can do to save energy. Laura’s dedication to improving her home and community’s energy usage reflects her passion for combating climate change. By taking steps large and small – from solar panels to simple plastic window covers – Laura has been able to conserve resources and set an example for those around her. She’s also seen savings on her energy bills along the way. If you’re looking for ways to save, look no further than the biking banana!